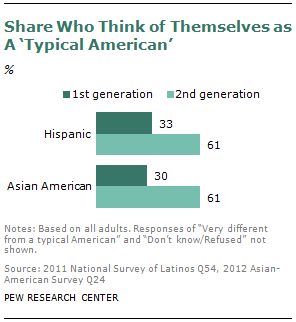 Pew Research Center surveys of Hispanics and Asian Americans – the groups that comprise the bulk of the modern immigration wave – find that 61% of adults in the second generation consider themselves to be a “typical American.” That’s roughly double the share of their immigrant forebears who say the same. But for these adult children of immigrants, seeing oneself as a typical American has not meant losing their overriding sense of identity with their family roots. A majority of the second generations of both groups say they most often identify themselves either by their ancestral country of origin (e.g., Mexican; Chinese American) or by a pan-ethnic or pan-racial term (e.g., Hispanic, Asian American). The surveys, along with an analysis of U.S. Census Bureau data, find that Latinos and Asian Americans differ markedly both in their language skills and in their views on the importance of maintaining the language of their ancestral home. While fully three-fourths (78%) of Asian immigrants in the U.S. speak English either very well or pretty well, about half of Hispanic immigrants (48%) are English proficient. This may reflect the fact that a large share of Asian American immigrants are highly educated and often come to the United States to obtain even more education, while a large share of Hispanics who come to the U.S. have less education and come primarily to work.